Dr. Andrew Jones was raised on a farm in rural British Columbia, Canada. He grew up reading James Herriot books, stories about the life of a mixed animal veterinarian in rural England. These humorous stories inspired the young Dr. Jones and painted a picture of a dedicated vet and a fulfilling life. Since graduating with his DVM from the University of Saskatchewan in 1992, Dr. Jones has been practicing, until recently, as a small animal veterinarian and has treated thousands of animals. He has a special interest natural, alternative health remedies for pets and has written several pet-health books, has produced over 50 Videos on home remedies for pets, hosts an online members-only dog and cat health website, created a unique Home Study Course on alternative dog and cat health, and has written countless pet health articles. He is the previous owner of the Nelson Animal Hospital, in Nelson BC. For his daily online newsletter, Veterinary Secrets, join here: www.veterinarysecretsrevealed.com. Dr. Jones' pets, Lewis, Jesse, Gussie and Cleo, are a part of his family. This philosophy of animals being members of the family is applied to his practice as well; his client's pets are a part of their family and they deserve the best care possible. For more information about Dr. Jones visit his blog at www.theinternetpetvet.com. Are You Ready to Order Dr. Jones' Ultimate Feline Health Formula? Copyright © 2019 Four Paws Online Ltd. All Rights Reserved. 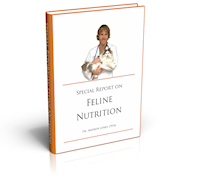 "Special Report on Feline Nutrition"
Get my FREE e-Book - just enter your name and email below!